An ironic protest and parody of the musical philosophy of serialism. Conceived from the position that serialization can be applied not only to the aspects of music explored by Boulez, but also to actual sounds, in this case the 128 instruments of General MIDI. 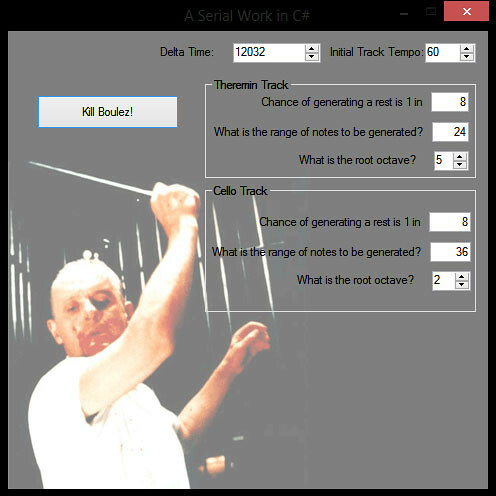 Explores the concept that music generated randomly by computers can produce music comparable to serial works, given the right parameters. Composed with the aid of an application programmed in C# (created specifically for this piece with the help of Matthew Dunphy) which generated the cello, Theremin, and MIDI lines.